It's a Puzzle - When did Ferry Service begin at Port Maitland? On occasion I have been referred to as an historian. This may be a bit like calling a science teacher a scientist. The science teacher is well equipped to do what he or she does, but generally repeats information discovered and proven by the scientist! Better you should call me a history nut! Most of my articles leave you with more questions than answers, and this is Okay with me. In fact it is just where I want you! So here is yet another article which will leave you with many unanswered questions. 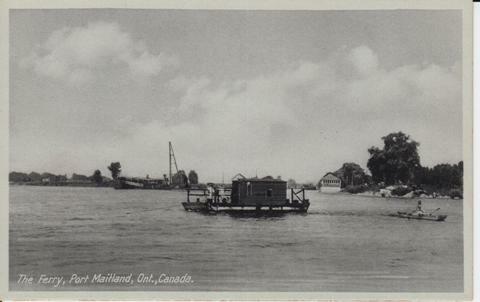 Until the early 1950's, there was a cable-operated ferry at Port Maitland, which pulled passengers and freight back and forth across the Grand River. By the late 1940's, the federal government ended its obligation of providing free services. 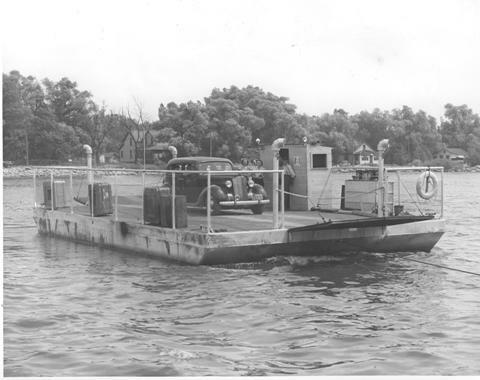 The last few years were provided ( with a user a fee), by Gordon (Chummy) Clark, and Elmer (Heaps) Pyle, using their specially constructed vessel aptly named the CHUMMY HEAPS. The late Earl Siddall, often asked me when the original service began. I have not worked that one out! I do know from old newspaper articles there was a service in 1898. This is the first mention I have found in area newspapers. 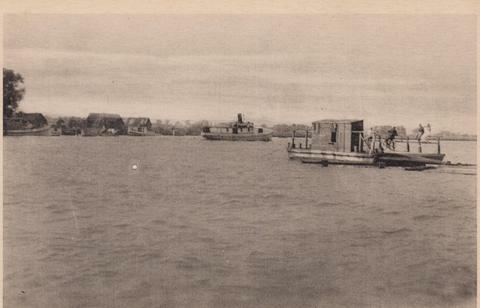 Local papers told of citizens discontent regarding the delay of the opening of the Port Maitland ferry service when it was not yet operating by April 29, 1898. What the articles fails to state is, if this was the seasonal restart after a winter layover. There is some support for this theory. In the obituary for Dennis Corcoran of The Locks, (a reference to the village surrounding Lock 27, at Port Maitland) I find that in the spring of 1897, Dennis was appointed manager of the ferry at Port Maitland. This could however, be a date error. In support of this date being an error I find yet another article which tells us Mr. Scott of Byng, Superintendent of the canal was in Port Maitland on May 7, 1898, and appointed Dennis Corcoran lock tender in charge of the ferry. Further articles imply this may have been the first year of service. On May 6, 1898 I find Mr. Martin removed a fence which lay across the road, blocking ferry service. Service was expected to begin within a couple of days. Who was Mr. Martin? There were Martin’s in Port Maitland at this time, but they were the owners of the two hotels on the west side of the river, and I find no reason to suspect either would have cause to have dispute with the government over road use. 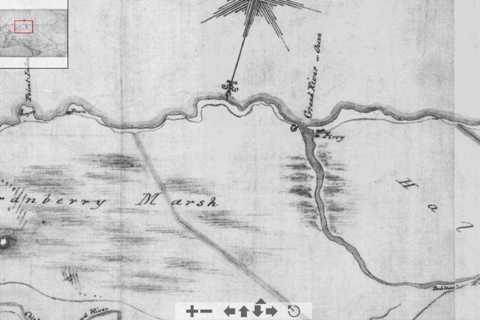 It is more likely this Mr. Martin was from the east side where the land ownership was at best confusing. By May 20th a road is finally completed connecting the ferry to the main road. This again makes me feel Mr. Martin was from the east side. 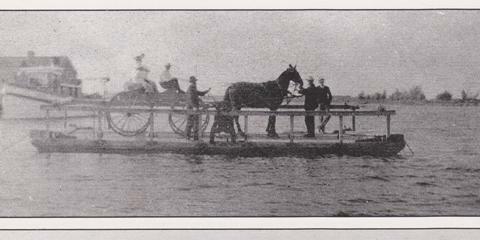 By June 1st many teams of horses had used the ferry, but Mr. Corcoran was not yet in control of the ferry. So who was? Were the residents of our sleepy little port so angry by the lack of service they took over the ferry and operated it like a troop of militants? Then there were the snipes at Dennis Corcoran. Early in June of 1898, it is learned the ferry service is doing gang busters, and will continue to be operated by Dennis until the right man comes along! By late June the following note is found in the Chronicle. The people of our village and vicinity are far from being satisfied with the management of the ferry boat, and at the present time give full vent to their feelings because the boat does not run longer than six o’clock, and also because foot passengers are barred from crossing. The people now begin to ask themselves in what manner the ferry benefits them. Dennis Corcoran died in 1905, and remained in his government appointed position until that time, when James Barry took over his duties. Still another piece of the puzzle is added when we find the government drove piling into the river in June of 1898 making the approach less difficult. By now as many as fifty teams a day were using the service. Again, in August; The ferry is expected to be operating soon! You figure it out! My research will have to go forward into future years to learn how Dennis operated the ferry and what controversies went with his tasks. Ain’t history fun!